"This is a sweet and sour casserole with bacon and beans." Saute onion in bacon fat; add the brown sugar, mustard, garlic powder, salt and vinegar. Cook covered on low heat 20 minutes. 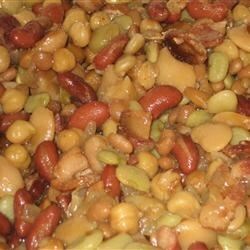 In a four quart baking dish, combine the bacon, onion mixture, butter beans, lima beans, kidney beans, garbanzo beans and baked beans. Mix well, and bake covered for 1 1/2 hours. Uncover and bake 30 to 45 minutes longer. Great recipe! Very easy and very tasty. I substituted ground beef for bacon and it turned out great. Thanks for the recipe! This recipe was excellent, could not find canned butter beans so I used a can of cannelli beans instead. This recipe is definately a Keeper!....I used vegetarian bacon ...that's the only change I made. This will be a FAVORITE for sure! Thanks for sharing your wonderful recipe.